What is this medicine used for? Cefixime, also known as Suprax, is a type of antibiotic called a cephalosporin. The active ingredient cefixime kills a wide variety of bacteria and is used to rapidly treat a wide range of infections. A course of Cefixime will usually clear the infection within a few days. Cefixime (Suprax) is available online through a Dokteronline.com partner pharmacy. This medicine requires a prescription or an online prescription. 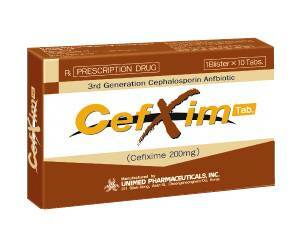 Cefixime works instantly and provides relief from symptoms such as pain, fever and malaise within only a few days. Cefixime tablets should be swallowed whole without chewing with some liquid. This can be done before, during or after meals. Cefixime is prescribed as a course. Always finish the entire course, even if you feel better. Stopping early could cause the bacteria to linger in the body and the infection to return. The length of the course is determined by a doctor for each specific patient. If you have forgotten to take your Cefixime tablet, do so as soon as you remember. If you have forgotten to take a dose and it’s almost time for your next scheduled dose, then skip the missed dose and continue your regular dosing schedule. Never take a double dose to make up for the forgotten one. Adults and children aged 12 and above: one to two 200-mg tablets a day for as long as the doctor prescribes. Children under the age of 12 require a different dose. Read the package leaflet before use. Diarrhoea and other gastrointestinal symptoms. Consult a doctor if the side effects are severe. See the package leaflet for a complete list of possible side effects. You are allergic to cefixime or other cephalosporin antibiotics, or any other ingredient in this medicine. Do not use this medicine if you are allergic to penicillin antibiotics without consulting a doctor first. Consult a doctor on the use of Cefixime if you have a kidney condition or other health issues, or if you are currently taking medication. The doctor will be able to advise you whether you can use this medicine safely. For more information on contraindications, possible interactions and warnings, see the package leaflet. Do not use Cefixime, or only with a doctor’s approval, if you are pregnant, planning to conceive or breastfeeding. This medicine does not affect your ability to drive. In rare cases it may cause dizziness. Stay out of traffic if you experience this side effect. This medicine does not interact with alcohol.